PAG Metal Wine Rack, conveniently and elegantly store your favorite wine. This metal wine rack has room for up to 7 standard bottles(Diameter less than 3.5inch) of your favorite wine. Each wine bottle is stored horizontally, ensuring both the wine and the air bubbles are in contact with the cork, keeping corks moist, so that the wine can be stored longer until you're ready to enjoy. Efficiently maximize storage space, matches any home, kitchen, dining room, wine cellar or bar. 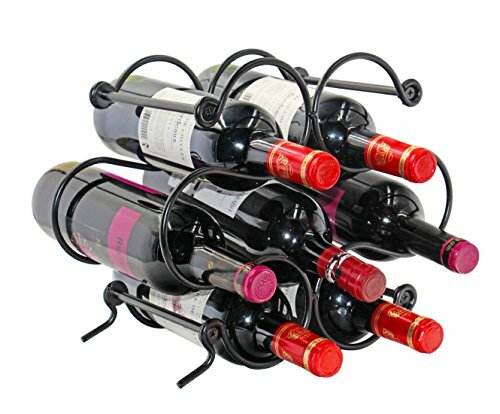 The wine rack is made of high quality metal material with durable powder coat finish, anti-oxidation and anti-rust. Sturdy structure prevents wobbling, tilting or falling. Great for many years and withstand lots of use. Chic Contemporary Design. The simple yet elegant design of the wine bottle rack makes it a great display piece that you'll be proud to have out. Great gift for the wine aficionado, wine collectors and expert connoisseurs in your life! Don't hesitate! Put it on your cart now! Size: L12.32" x W6.7" x H10.32", Hole Diameter: 3.54"
Maintenance: The wine rack can be easily cleaned with a dry cloth or hand wash with warm soapy water and dry promptly. If you have any questions about this product by PAG, contact us by completing and submitting the form below. If you are looking for a specif part number, please include it with your message.